Posted on Sep 3, 2015 by Appleton Downtown Inc. I was invited to be a part of the Farm Market bloggers this summer. Being a ‘foodie’, I was excited to have been asked and curious about the vendors that were selected for me. I was truly not disappointed! I was thrilled to see Uncle Mike’s Bake Shoppe on my list of vendors to visit. This bakery has a lot of history. Mike Vande Walle and his wife Mary, opened Uncle Mike’s Bake Shoppe in DePere in 2001. Then in 2003, due to the increase of customers flocking to their place and space getting a little tight, they opened another Bake Shoppe in Suamico. Mike’s baking history started back in 1974 with his parents, Don and Norma Vande Walle, at the Mehlberg’s Bakery in Shawano. In 1987 the family opened Vande Walle’s Candies in Appleton – what could be a better mix than candy, bakery and ice cream. Then in 2001 that Mike and Mary ventured out and established Uncle Mike’s Bake Shoppe which has become one of Wisconsin’s Award Winning Bakeries. We must start this blog focusing on their award winning Kringle! Outrageously delicious! 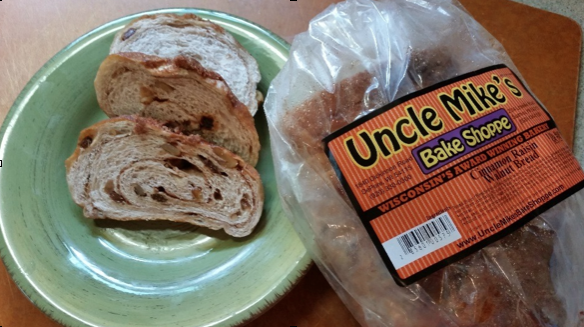 Uncle Mike's won the North American Kringle Competition in September 2014 for their Sea Salt Caramel Pecan Kringle. They also won 2nd and 3rd place in the 2014 Bakers Best (Wisconsin Bakers Association Competition) Kringle Competition with their Turtle Kringle and Caramel Apple Kringle. In 2015, they won first place at the Baker's Best Kringle Competition with their Big Hawaiian. 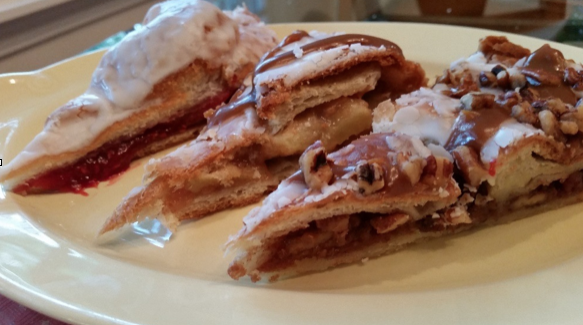 The Kringle display in my photo (back to front) is the fresh Raspberry, Caramel Apple and the Sea Salt Caramel Pecan. After visiting Mike’s stand, I was heading out of town and decided this would be a great time for a tasting with family. I can share with you that we all had our favorites. The filling was generous, as were the nuts in the Sea Salt Caramel Pecan! I heard a lot of ‘mmmmm’s’ during our tasting. I can understand why they are award winning Kringle! Be sure to stop by and select a Kringle (you can also buy half Kringle’s) – it will be a tough decision on which one or how many you’ll leave the stand with. 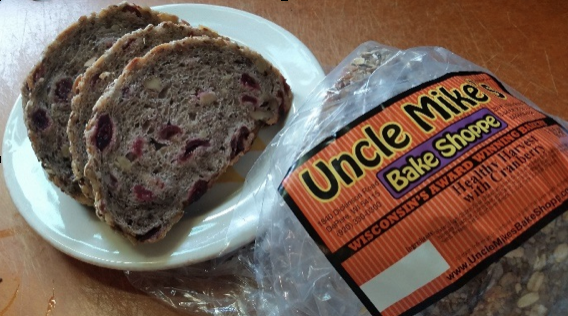 Then there is the BREAD by Uncle Mike’s! I don’t know about you, but bread is one of my downfalls and the bread was crazy good. While I was taste testing the many selections, I started to chat with a gentleman who drives from Appleton to DePere just for the Cinnamon Raisin Walnut Bread. He said it makes the best ever toast for breakfast. If he doesn’t make sure to get his two slices for breakfast when he brings it home, his family will have eaten it before you know it! This guy was a definite Uncle Mike’s fan without a doubt. There is an abundant amount of raisins and walnuts along with the perfect swirl of cinnamon and sugar. Yum! You’ll be a fan too. Five years ago it was named the “Best Raisin Bread in America”. …..I’d say it still is! The Healthy Harvest with Cranberry bread really fascinated me. It takes 34 hours from mixing to baking to packaging! There is no sugar or shortening in the recipe. The little bit of sweetener that you can taste comes from the cranberries. It is a good solid bread with great flavor in every bite. It is by far the #1 seller in the Shoppe! Be sure to stop by Uncle Mike’s Bake Shoppe stand. He is located off College Avenue down Oneida Street. There are so many, many baked goods that I did not get to taste that I should mention. The Gourmet donuts were creative and huge! There were cookies and pies too! I understand that they now have their Carmel Apples available. I can only imagine how great those will taste. Check it out!